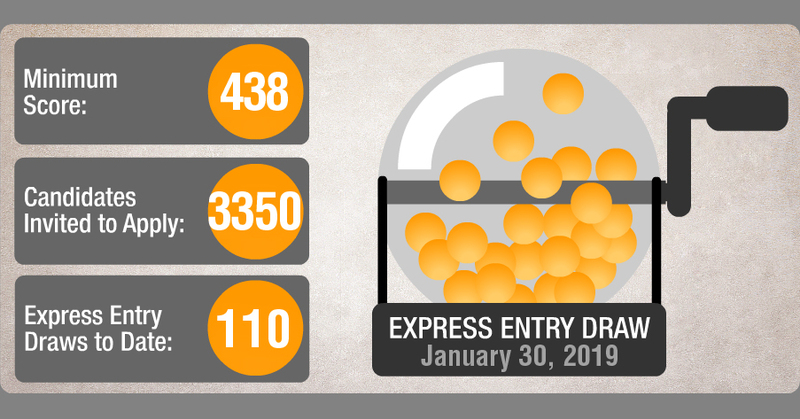 February 2, 2019 Brian L.
Express Entry held an expected draw Wednesday, dropping 5 Comprehensive Ranking System points from the previous draw to a low of 438, which is the lowest minimum CRS score draw since October, 2017. While the number of invitations dipped to 3350, it still remains at a total of 11,150 invitations to apply sent for January 2019 and makes it the highest number of invitations ever issued in a month of January in Express Entry’s five year history. January 24, 2019 Brian L.
Another big draw for invitations was issued for 3,900 Express Entry candidates yesterday. The comprehensive ranking system points (CRS) dipped down 6 points to 443 this time, compared to the previous draw on January the 10th. January 14, 2019 Brian L.
The first Express Entry draw of the year is also the largest first draw of any year to date: 3,900 invitations to apply for permanent residence were drawn January 10th, 2019. For this round of invitations, the comprehensive ranking system score jumped up 10 points from the previous draw to 449 points. This could be the year with the largest draws in Express Entry’s five year history if the previous draws are an indication. Last year’s total was 89,800 Invitations to Apply sent.